Researchers agree that students retain more when active, student-centered learning techniques are employed. When faculty facilitate involvement in activities such as simulations and games, and students work collaboratively, through role-play and debate, deeper learning and transfer occurs. As part of my efforts to include more active and student-centered learning opportunities into my courses and to encourage knowledge, skills, and attitudes that support higher-order thinking tasks such as analysis, synthesis, and evaluation, I added a Reacting to the Past role-playing game to my introductory-level art history course. 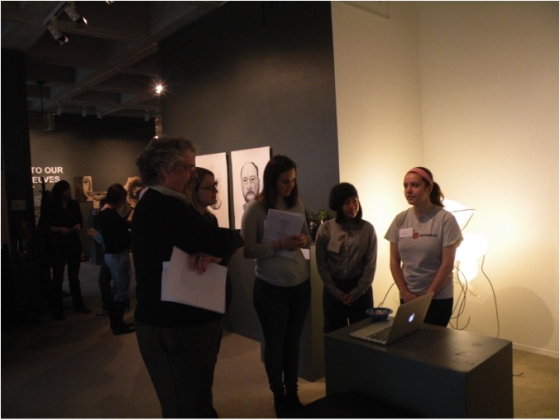 During the 2013/14 academic year, Ithaca College students enrolled in Episodes in Western Art have played the Reacting game “Modernism vs. Traditionalism: Art in Paris, 1888-89.” Although some research has been conducted on the use of Reacting games in first year seminars (Stroessner, Beckerman, and Whittaker 2009), little scholarship has addressed specifically the applicability of this pedagogy to the art history classroom. Here, in this short post, I reflect on my employment of the game and demonstrate its efficacy (see here for my longer paper on the subject). 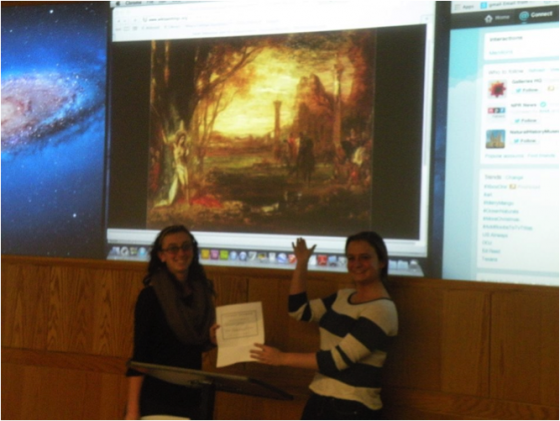 Episodes in Western Art is an introductory-level course offered by the Department of Art History at Ithaca College. The class is designed to introduce students to the study of art by focusing on particular times and places that have played key roles in shaping western visual culture. The chosen topics are discussed from a variety of perspectives, including style, artists’ techniques and materials, potential interpretations, and socio-historical contexts. The course covers a broad history of art, raises questions about the sources and authority of that history, and familiarizes students with key terms and methods employed by art historians. The inquiry-based and integrative learning philosophies that underpin Episodes in Western Art, as well as its episodic structure made it a particularly appropriate forum for the use of a Reacting game. Reacting games, such as “Modernism vs. Traditionalism,” use play to simulate real-world events, and although they can be entertaining, their main purpose is education. Although not often employed in higher education, games and play are essential to the development of creativity and support bonding, socialization, and community building. Stuart Brown has used brain mapping to illustrate that play activates the frontal cortex and assists in emotional regulation, mindfulness, and contextual memory. Cataloguing the play profiles of thousands of patients, he has determined that play is an active part of the lives of successful people and has shown the tragic consequences of a play-deprived life. As he argues, play is not only a transformative force, but it is necessary to human survival. Following the research on play and game-based learning, Mark C. Carnes began developing Reacting games in the late 1990s. Since then they have been implemented by faculty at over 300 colleges and universities in the United States and abroad. Designed to show students how individuals determine events and how historical circumstances emerge from particular social contexts, Reacting games use role-play to situate students in a defined historical moment. In the case of “Modernism vs. Traditionalism: Art in Paris, 1888-89,” developed by Gretchen McKay, students become artists, critics, and dealers in late-19th-century Paris. The game begins at the Salon of 1888 and culminates in a restaging of the 1889 Exposition Universelle de Paris. Game materials include an instructor’s manual, pedagogy manual, student game book, and a PowerPoint presentation. The instructor’s manual provides historical background, suggestions for class exercises, and role sheets for 35 characters. Twenty-eight of these roles are played by students enrolled in the course and include academic and avant-garde artists, art dealers, and critics; the other seven roles are for faculty or other students not in the class who play the role of buyers at the 1889 World Fair. The role sheets include biographical information and instruct students on their character’s objectives. The student game book, which I posted to the course learning management system, includes an introductory vignette and provides historical background, a glossary of terms, a game schedule, a list of the roles in the game, translated excerpts of contemporary art criticism, and a bibliography of primary and secondary sources, some of which were put on reserve in the Ithaca library. The accompanying PowerPoint presentation includes images from the 1888 Paris Salon. My class met for an hour and fifteen minutes twice a week. Five weeks were set aside for the game. On the first day of the game, I explained how the game would work and went over the schedule and grading scheme. The students’ homework was to read the student game book. The second day I gave a lecture that provided historical context for the game, and I handed out the role sheets. The students’ homework was to research their characters and write their introductory speeches. On day three, the students introduced themselves in character. The fourth day the classroom was transformed into the Salon of 1888 and students, playing members of the French Academy of Painters and Sculptors, led the class. They presented awards and gave speeches on the future of art. Characters, including William-Adolphe Bouguereau, Jean-Louis-Ernest Messoinier, Jules Breton, and Jean-Léon Gérôme, used their speeches to persuade the class on the value of Academic painting. During the next class period the future of art was debated. Students playing artists who supported newer styles of art and condemned the Academy as outdated, such as Claude Monet, Mary Cassatt, Edgar Degas, Vincent Van Gogh, and Paul Gauguin, gave speeches and presented their work. During this class period it was announced that a seat had opened in the Academy and elections were held to fill the vacant seat. The role sheets for Gustave Moreau, Auguste Renoir, John Singer Sargent, and James Abbott McNeill Whistler instructed these characters to vie for the seat. Speeches were given and members of the Academy voted. After the induction of the new member, the Academy met to decide how to organize the Salon of 1889. The following class period was led by critics and dealers, including André Michel, Joséphin Péladan, Félix Fénéon, Georges Petit, and Paul Durand-Ruel, who gave speeches endorsing artists and expounding on their views of art. The critics awarded “Critic Tickets,” which guaranteed sales for those artists who received them (Figs. 1-3). The next class period was reserved as a planning day. Students playing members of the Academy had to decide who to include in the official Salon of 1889, students playing dealers Petit and Durand-Ruel had to solicit artists for their booths at the Exposition Universelle of 1889, and others had to plan whether they would band together for group shows, set up alternate exhibitions, show alone, or boycott the Fair. Students also had to determine how they would exhibit their work, advertise their shows, and lure buyers to the World Fair. The game culminated with a restaging of the 1889 Exposition Universelle de Paris on day eight. For my course this restaging occurred in Ithaca College’s Handwerker Gallery. 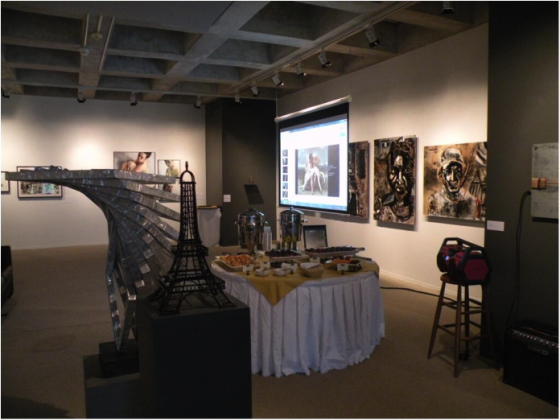 To help transform the gallery, we erected a model of the Eiffel Tower, projected Thomas Edison’s film of the Fair, played music by Claude Debussy, and served French pastries (Figs. 4 and 5). Faculty and staff were recruited to come as contemporary celebrities, including Oscar Wilde, Buffalo Bill, and Annie Oakley. Others were invited to attend through Ithaca College’s online newsletter, Intercom, by posters hung around campus, and through social media, including Facebook and Twitter. 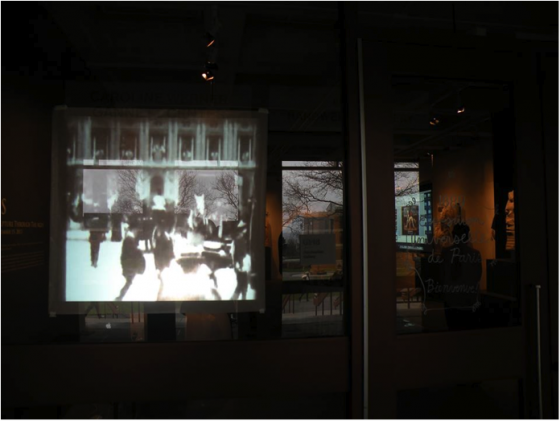 The Academy projected the paintings included in their Salon via an LCD projector and large screen in the main gallery. The dealers were set up in alcoves with laptops to show their artists’ images (Figs. 6 and 7). Independent artists were allowed to show their work on iPads or tablets. The students’ presentations of their character’s work and their ability to persuade visitors to buy their art determined the winners of the game. Points were awarded for being elected to the Academy, for receiving critic tickets, and for sales. There were three winners: the artist who sold the most work; the critic who endorsed the artist or artists who sold the most work; and the dealer who made the most sales. The day following the Fair was reserved for what Carnes terms the “post mortem.” During this class period winners were announced and presented with certificates. There was a brief lecture on the actual circumstances of the 1889 Paris World Fair and on the fate of some of the artists. Students were then asked to share their thoughts and reflections on the game as a whole. Students were assessed on the quality and persuasiveness of their speeches, the clarity, accuracy, and elegance of their written products, their performance at the Paris World Fair, and their overall participation in the game. For my class, I made the game worth 30% of the students’ final grade. The following elements of the game were assessed: introduction in character (two- to three-minute speech worth 3%); persuasive speech delivered in character (five-minute speech worth 5%); persuasive paper posted to the course blog (approximately 500-750 words, 5%); participating in the game and demonstrating historical understanding and embodiment of character (participation was demonstrated through in-class discussions, tweets, blogging, and creation of didactic and promotional materials and was worth 7%); and a reflective essay (750-1000 words worth 10%). The reflective essay asked students to answer the following questions: how well did your character meet his/her objectives; what did you do in the game to try and meet these objectives; what research did you do to help you understand your character and the historical time period; what would you do differently if you had the chance to play the game again; was the game an interesting and effective way to learn about 19th-century French art; and how well did this game address the inquiries of your theme. Overall, students commented that the Fair felt real to them and that they were invested in their character’s success. Engagement with their characters was enhanced through the use of 21st-century technology including the course blog (www.episodesblog.wordpress.com) and Twitter (#rttp@watson74k) (Figs. 8 and 9). Students posted their speeches and comments on the blog and tweeted in character. For example, the student playing the role of conservative art critic André Michel tweeted during Monet’s speech, “Landscapes are barely good in the first place why make it worse with impressionism” and “genre scenes [are] meant only for the unsophisticated tastes of the public.” Whereas the student playing the role of critic Félix Fénéon tweeted during the Academy’s presentation of awards, “Art needs diversity not replications of one another. The academy is surely going to ruin art and creative ability.” Incorporating 21st-century technology into the game heightened students’ enthusiasm and engagement with the material. 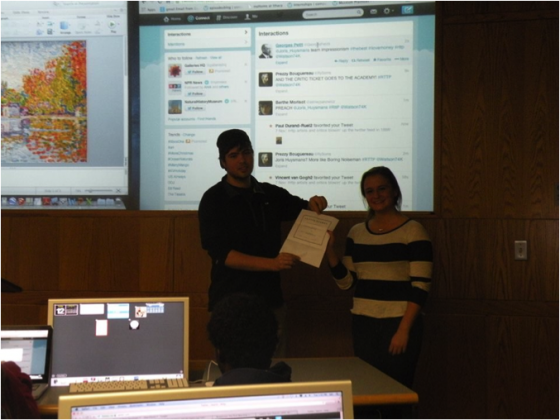 Tweeting also proved particularly effective as students tweeted pithy remarks in response to speeches by other artists, critics, and dealers. It also proved popular, as several students referenced it in their reflective papers as one of their favorite parts of the game. In addition to the students’ positive responses, I found that teaching with a Reacting game was effective and interactive. Students wanted to win the game and worked hard to meet their characters’ objectives. In order to do this, they had to research the historical circumstances of their characters and the artwork that they created, supported, or disliked. The game encouraged competition, but it also promoted teamwork as the students had to build alliances and work cooperatively to solve problems. As outlined by Carnes, the motivational inducements of Reacting games include: escaping from oneself; competition; teamwork; empowerment; engagement with the past; taking part in a drama; and liminality. Students who played the game were able to recognize and explain the forms, techniques, and processes of 19th-century French art. They analyzed how art stimulated emotions, provoked thoughts, and guided actions. They articulated in written and oral discussion the role of the creative arts in the construction of western history, and they discovered how artists transformed the issues of their world into visual art. They used primary and secondary sources to interpret art, and they investigated how different systems of philosophical, literary, religious, and historical thought shaped late 19th-century values. The achievement of these learning outcomes was measured by the students’ performance in the game and the average score on the game was 93%, eight percentage points higher than the scores on the exams for parts one and two of the course. Thus the game was not only more effective than a traditional slide lecture, but it was also more fun. 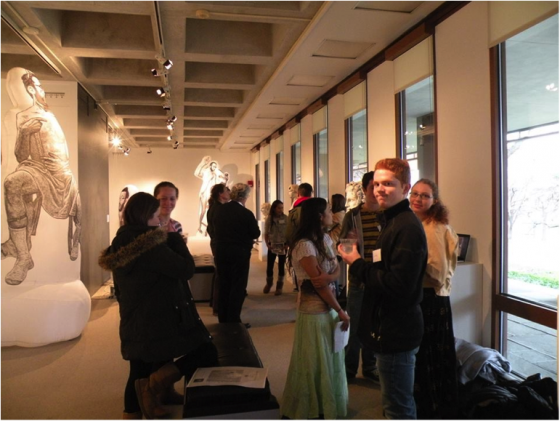 “Modernism vs. Traditionalism” fostered a successful learning environment, one that was active and student-centered, and the game proved to be an effective addition to the art history classroom. Although this iteration of the game was played at a small liberal arts college, a Reacting game like “Modernism vs. Traditionalism” has the potential to transform any art history classroom. I am now on the faculty at the University of Central Florida, the second largest university in the United States, where art history class sizes range from sixty to 300 students. I am currently developing a game set at the 1993 Whitney Biennial that includes roles for artists, curators, dealers, buyers, critics, politicians, and spectators. I am particularly interested in the scalability of the Reacting pedagogy as well as its adaptability to the more recent past, and I believe the concept offers great possibilities for the teaching of art history, theory, and practice. Fantastic post! Thank you for bringing your experience here — this is such important work, and the playtesting of these games is so critical to making them succeed.